Whether it’s served to go along with burgers and hot dogs or as a side dish for your favorite deli sandwich, coleslaw provides a delicious way to consume healthy veggies. Carrots are a staple in most varieties of coleslaw and along with adding a sweet taste they provide vitamins A, C, K, potassium, folate and choline. Shredding carrots is ideal to get just the right consistency so that they complement the cabbage and other ingredients in the coleslaw. You can shred carrots using a food processor or a hand held grater. Peel the outside skin off of your carrots using a vegetable peeler. Remove the ends by cutting them about ¼ inch in from each end with a kitchen knife. Rinse any dirt off of the carrots by placing them under running water. 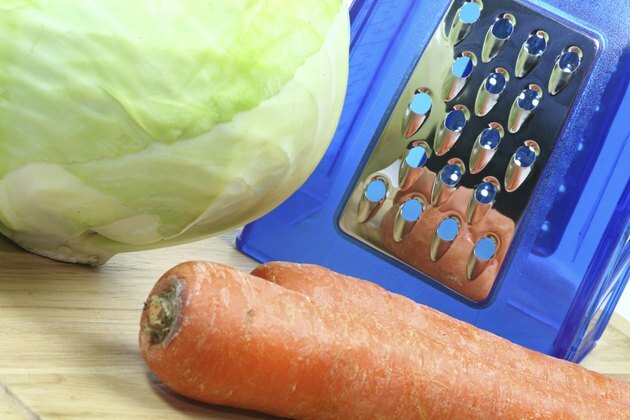 Use a stand up grater rather than a flat version; the square or cone stand up grater is easier to maneuver and will give you more options for shredding your carrots. Choose a model that has the teeth on the outside of the grater rather than the inside. Grate your carrots on the coarse-teeth option by moving the carrot up and down over the protruding teeth. Gather the shredded carrots that fall inside and under the grater and add them to the coleslaw. Peel the outside skin off of your carrots using a vegetable peeler and cut the ends off, about ¼ inch in from each end. Rinse the peeled carrots under running water to remove all dirt from the veggie. Cut the carrots in halves or thirds so that they shred more effectively when put into the food processor. Place the grating attachment and lid onto your food processor and turn it on. Put the carrots into the chute of the food processor and remove the shredded carrots when they are finished grating. Add to the other coleslaw ingredients.